The End of White America: An Exchange by Ron Unz, et. al. Readers of COMMENTARY who are not knowledgeable about the events surrounding the passage of three important ballot initiatives in California-Proposition 187 in 1994, Proposition 209 in 1996, and Proposition 227 in 1998 should not be taken in by Ron Unz’s dishonest and self-serving misrepresentation of them in his article, “California and the End of White America” [November 19991. In the guise of a warning about the supposed rise of “white nationalism,” Mr. Unz not only insults the people of California but impugns the character and integrity of former Governor Pete Wilson, whom he plainly cannot forgive for trouncing him so effortlessly in the 1994 Republican gubernatorial primary. Mr. Unz has consistently sought to distort Wilson’s record a record with which I am intimately familiar, having served as the governor’s press secretary for the entire period covered by Mr. Unz and as his deputy chief of staff for some of it. With respect to Proposition 187-which banned all non-emergency government services for illegal immigrants-Mr. Unz, accepting the view propounded by liberal politicians and the media, attributes the proposition’s landslide victory to the votes of privileged, frightened, nativist whites eager to “scapegoat” Latinos for the 1992 Los Angeles riots and for the state’s economic woes. In doing so, he demonizes the people of California. They understood because the issue was not new to them, thanks in large part to Wilson’s long record of activism in pursuit of federal reform. As mayor of San Diego, he had tried to get President Carter to address the problems that were already resulting from our porous southern border. In the U.S. Senate, he had protested the rising crime and health costs of local governments in California because of illegal immigration. And as early as 1991, in his first year as governor, he had told Time that though Californians took pride in their immigrant history and welcomed new citizens from other states and nations, there was a limit to how much the state’s taxpayers could be asked to pay to support newcomers. As Wilson said at a news conference that year, the heavy burden placed on the state budget by federally-mandated services for illegal immigrants-over $2 billion annually (now over $3 billion)–would preempt funds needed to provide services to legal residents. That is why he formally requested federal reimbursement for these costs and finally, frustrated by the total lack of a response, sued the federal government. This is hardly the history of the cynical Johnny-come-lately whom Mr. Unz portrays. Rather, it is a clear record of sustained, principled, and vigorous demands for federal acceptance of federal responsibilities and for federal fairness to the taxpayers of California. [The common white stereotype of darker-skinned peoples as especially prone to government dependency proved irresistible. “Stopping welfare for illegal immigrants” became a powerful slogan…. The results were immediate. Wilson . . . saw his approval rating shoot up almost overnight. The ugliest of Mr. Unz’s false charges is that Wilson, in supporting Proposition 187, gave “implicit sanction… to far more extreme words and deeds.” But Mr. Unz-like others who have engaged in character assassination over Proposition 187-offers no evidence that Wilson ever gave any sort of sanction to any extreme word or deed. In the absence of such evidence, Mr. Unz resorts to criticizing the very effective television ad that Wilson aired in support of the proposition. As Mr. Unz puts it, the ad “featured gritty black-and-white footage of illegal aliens scurrying across the Mexican border like an army of subhuman invaders, but then balanced this harsh image with reverent shots of the Statue of Liberty and of legal Latino residents taking the oath of U.S. citizenship.” He omits to mention that this “gritty black-and-white” film is official Immigration and Naturalization Service footage, recording the reality of illegal immigration. Nor does he explain why a politician who is supposedly anti-immigrant would associate himself with pictures of legal immigrants experiencing the pride and joy of becoming American citizens. Mr. Unz does no better in recounting Wilson’s role in the victory of Proposition 209, which ended racial and gender preferences in public employment, contracting, and university admissions. He describes Wilson’s participation in the initiative as a “strategic calamity,” but it was Wilson and Ward Connerly-a Wilson appointee to the University of California Regents-who directed the successful campaign, raising the necessary funds with only minor assistance from the Republican party. Obviously, Connerly was the driving force behind Proposition 209, but as he himself has acknowledged, it was Pete Wilson who helped and encouraged him to take the lead. Concerning his own role in Proposition 209, Mr. Unz adds that, having hoped to involve himself “heavily” in the initiative, he “was understandably rejected once Wilson’s operatives gained influence in the effort.” Strangely, no one on the campaign can recall that Mr. Unz volunteered his services. Pete Wilson has publicly given Mr. Unz high marks for his leadership of Proposition 227, the successful effort to end the destructiveness and wasted opportunity of bilingual education. Typically, in describing one of the major financial backers of the opposition to Proposition 227 as a “close ally of Governor Wilson,” Mr. Unz neglects to mention that the same Governor Wilson was the only major political figure in either party to endorse 227. Finally, Mr. Unz reports that in 1994, Governor Wilson was “the most unpopular incumbent in California history.” What he fails to say is that by the time Pete Wilson left office in January 1999, 80 percent of Californians felt that the state was headed in the right direction, and Wilson’s high approval rating matched that of Governor Ronald Reagan when he left office. In this grossly unfair and mean-spirited article, Mr. Unz engages in the worst kind of revisionism. Pete Wilson-and the readers of COMMENTARY-deserve better. Ron Unz’s piece on the tragedy of ethnic politics in California is quite correct. The ill-starred campaign for Proposition 187-which banned most government services for illegal immigrants-was a moral error and a political blunder. I am grateful that a few prominent conservatives, such as William J. Bennett and Jack Kemp, spoke out against it. Mr. Unz also deserves our praise for helping bring an end to bilingual education in California, a change that has already begun to help immigrant children learn English. But I would ask Mr. Unz to recognize that though America is an assimilationist nation, the flow of illegal immigrants poses a problem that deserves careful attention. The goal is not to end immigration but to control its flow; to select, to the extent that we can, people who can bring some special skill to the country; and to facilitate the entry into citizenship of illegals who have been here for many years and have remained free of criminal charges and welfare abuses. This is especially important in California, which is vulnerable to more mindless anti-immigrant posturing if the economy turns sour or a clever politician inflames our sentiments. This is not an easy matter. Controls at the border have become much tighter, but they are only partially effective. About half of all illegals enter with tourist visas and then overstay their limits. I have no easy solution, other than to ask the anti-immigrant activists and the pro-assimilation critics to talk sensibly about ways of moderating the flow of illegals and giving regularized status to those trouble-free illegals who have been here for several years. Ron Unz sheds some needed light on an important element of our country’s immigration/assimilation problem. Statements like Patrick Buchanan’s call for affirmative action in higher education for non-Jewish whites are simply a logical extension of the multiculturalism and racial preferences we have endured for the past generation, and more “European American” agitation is inevitable if we do not change course. Unfortunately, Mr. Unz’s prescription for reform is incomplete. With multiculturalism so firmly rooted in every institution-schools, day-care centers, corporations, churches, fraternal organizations, unions, libraries, local governments the process of rooting it out will be protracted and painful, if it is possible at all. Nevertheless, Mr. Unz rejects as illegitimate any reconsideration of an immigration policy that admits more than one million legal and illegal immigrants each year. He squares this circle in his own mind by holding to the belief that “the reality of the melting pot remains as powerful as ever,” even though “the ideology behind it has almost disappeared.” But if the ideological and political foundation of Americanization no longer exists, how can the melting pot be “as powerful as ever”? Americanization is more than learning English, getting a job, and buying a house-it involves the development in an immigrant (and, more importantly, in his children) of a visceral love of country and emotional attachment to America’s history as something “we” did, rather than something-“they” did. There is no question that the ethnic conflict and civic discord of multiculturalism have been generated by Americans rather than immigrants, and would have been present even had there been no immigration over the past generation. There is also no question that the immigrants already here must be embraced and Americanized. But to exacerbate the intractable problem of ethnic separatism and grievance politics by continuing high levels of immigration is simply irresponsible. Prudence demands that we limit the annual inflow to genuine refugees with no chance of ever settling anywhere else, the spouses and minor children of citizens, and a handful of people with extraordinary and unique talents. This would still yield more immigration than any other country allows, but it would be of great help to the efforts of Mr. Unz and others in reversing our country’s fragmentation. Ron Unz’s profound and somber warning about the political danger from America’s continuing demographic transformation deserves to be taken seriously. Though he perhaps exaggerates the importance of whites becoming a numerical minority, he is surely right to worry about the splintering of America should whites begin to feel and act like a political minority, with their own grievances and separatist agenda. His success with “English for the Children” (Proposition 227) may help to avert this catastrophe, but, alas, it is insufficient. The American melting pot on which Mr. Unz rightly places great stress has a limited capacity If the inflow of families who must be acculturated becomes too large and too rapid, these newcomers will coalesce into ghettos and reconstitute their own societies. The “left-liberal ethnic activists,” as Mr. Unz aptly calls them, will see to that. Eventually, the road back to the American melting pot will become permanently blocked by the powerful business interests, like the owners of minority-language television stations, that thrive on perpetuating this “diversity.” And our short-sighted politicians, who seek to min elections by propitiating the politics of grievance, will cement into federal law the damage done by the activists. It is puzzling that Mr. Unz, who convincingly describes this danger, recoils from thinking his insight through to the end. Let us not obfuscate the troublesome bottom line: the demographic changes at work here are largely an unintended consequence of the 1965 Immigration Act and of Congress’s inability to repair this legislation. I have recently joined the advisory board of the Federation for American Immigration Reform (FAIR), an organization that Mr. Unz calls “America’s premier anti-immigration lobby.” From what I have seen of FAIR, its efforts are focused on keeping the immigration laws from becoming yet more ineffectual, making it possible for America’s melting pot to function again, and thus averting the disaster A/in Unz so presciently warns us of. Instead of calling each other “xenophobes”–or “xenophilies”–it behooves us to make common cause to keep the United States united. Ron Unz is especially insightful in his analysis of the cynically late embrace of the California Civil Rights Initiative (Proposition 209) by Bob Dole and other embattled Republicans during the 1996 campaign. To judge by the legislation passed by Congress since then, the leaders of the GOP have decided to distance the party from the vital cause of overturning affirmative action. They have shortsightedly dismissed the results of a 1998 referendum in Washington State to end racial preferences in education, contracting, and employment, even though it passed by a margin of nineteen points. Mr. Unz’s discussion of America’s racial destiny is less persuasive, however. Here he presents two dichotomous futures: a new American melting pot, on the one hand, and white nationalism, on the other. This is overly simplistic, as the lines among the various competing ideologies are often blurred. Consider that supporters of Propositions 209 and 227, the melting-pot initiatives in Mr. Unz’s eyes, were also for the most part supporters of Proposition 187, the initiative that he connects to white nationalism. Ending state-supported benefits to illegal aliens and ending a failed system of bilingual education and racial preferences apparently squared in the minds of millions of California voters. Ron Unz correctly highlights the undesirable aspects of multiculturalism as practiced in California. A system of education that denies its students literacy in the dominant language and familiarity with the culture they live in is a cause for concern. It not only cheats the students involved but, if done on a large scale, threatens the cohesion of society. But Mr. Unz goes well beyond this legitimate concern. Rather than arguing for the acculturation of immigrants, he demands total assimilation. He not only wants Hispanics to learn English and the history and culture of America; he also insists that they surrender their own language and culture. It does not seem to occur to Mr. Unz that it is possible to satisfy his concerns without also demanding the homogenization of society. Schools can acculturate students while permitting them to retain their own cultural heritages. The graduates of our best Catholic and Jewish day schools are literate in English and familiar with American history and culture, but they are also proudly aware of their own identity and history. California could have created curricula designed to achieve a similar goal for its large Hispanic population. Bicultural schools that teach English and Spanish, American and Latin American history, could produce graduates capable of living successfully in two cultures-to their own benefit and to the enrichment of our society. The intermarriage rate is nearly as high for the children and grandchildren of Latino and Asian immigrants as it is for American Jews, and the acquisition of English by immigrants is as rapid today as it was for immigrants of the past. With the pervasive influence of television and the shopping mail, the forces of assimilation are probably more powerful now than ever before. To be sure, grievance-based politics and self-appointed ethnic group leaders can be irritating, but they pose no real threat to the health of our republic. And bilingual education in public schools is often a mess-but this is a problem having to do with monopolistic big-city public schools, not with native-language instruction per se. Ever the assimilationist, Mr. Unz recently wrote an opinion piece in the Sacramento Bee that opposed school choice because “our most vulnerable populations” might choose schools “preaching a range of ethnic-nationalist ideologies, which could have a lethal effect on our already fraying social cohesion.” This is unnecessary alarmism. just as the Know-Nothings of the 19th century attempted to ban private education to protect “vulnerable” Catholic and Jewish children from the backward ideas of their parents, Mr. Unz would like to limit the access of poor blacks, Latinos, and Asians to private schools to protect them from the dangerous ideas of their parents. As the experience of Jews and Catholics in the United States suggests, the obliteration of ethnic identity is a greater danger than the country’s splintering along ethnic lines. While appearing moderate, Mr. Unz’s views are actually quite extreme. He is so afraid of national disintegration that he gives every priority to the need for assimilation and no priority to the need for ethnic preservation. To persuade his audience of this view, he focuses upon examples that highlight unpopular or somewhat menacing ethnic groups when the logic of his assimilationist agenda applies to all. Ron Unz decries as false and demagogic the belief that California’s generous welfare arrangements serve as a magnet to impoverished foreigners. He states unequivocally that “nearly all immigrants come for jobs, not welfare.” This is a naive conjecture on his part. there is a virtual “hotline” from illegals living in the U.S. to their friends and relatives back home, informing them about the public benefits to which they will be entitled if they come to this country. Intensifying this pull is the highly profitable Mexican cartel engaged in the illicit smuggling of immigrants. Recruiters travel to villages throughout Mexico offering themselves as guides to the “good life” that awaits in the U.S., including jobs, welfare, and free medical care. Best of all, men and women are told that if they have a baby in the U.S., the child automatically becomes an American citizen, which entitles them to still more benefits. As far as education goes, the crisis of the Los Angeles Unified School District can only worsen as long as it continues its well-intentioned but disastrous “don’t ask, don’t tell” admissions policy. Statistics show that a school a day will have to be built in California to keep up with the student-population explosion due to illegal immigration. Ron Unz worries that white nationalism is a dangerous force that could break up the country. He suggests that if nonwhite immigrants can be more skillfully integrated and assimilated, racial nationalism can be defused and whites can be shepherded gently into permanent minority status. But if Mr. Unz is concerned about keeping the country together, why is white nationalism the villain, rather than the immigration of nonwhites that gives rise to it? Mr. Unz is asking white Americans to do something without precedent in the history of the world: voluntarily permit themselves to be displaced by people unlike themselves. The absurdity and, yes, the immorality of this are obvious if we imagine the shoe on the other foot. What if millions of white Americans were pouring across the border into Mexico, and preferred to speak English rather than Spanish, celebrate the Fourth of July rather than Cinco de Mayo? They would fundamentally change the texture of life in those parts of Mexico in which they lived. Can we imagine Mexicans trying to persuade themselves that this demographic transformation was “cultural enrichment,” even as it threatened to reduce them to a minority in their own country? People are tribal, and their nature will not be changed by exhortation. Mr. Unz is right: as whites become a minority, more and more will recognize massive third-world immigration as an intolerable assault on their culture and peoplehood. And, indeed, the country could break up as a result But do not blame white nationalism. Blame the foolish and suicidal policy of pretending that differences of race, Language, and culture are somehow sources of strength rather than sources of conflict. Major political leaders who have chosen to sacrifice their place in history for momentary political advantage often come to regret their Faustian bargain, as do their retainers; it is in this context that Sean Walsh’s apologia for his employer, former Governor Pete Wilson of California, should be understood. Although Mr. Walsh’s letter is far too long for me to respond to all of its points, I shall try to discuss the overall sense and a few major issues. 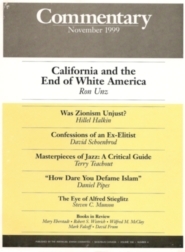 First, my intent in “California and the End of White America” was to provide as accurate and factual an account as possible of recent and important political events in the state; as readers of my article are surely aware, any discussion of Governor Wilson was merely a byproduct of that intention. Although elements of the media have portrayed Wilson as a racist and xenophobe, the flaws I implied were hypocrisy and opportunism, traits found to a greater or lesser degree in all politicians. In fact, I showed that most of California’s other leading political figures, including Democratic Senators Dianne Feinstein and Barbara Boxer, exhibited similar behavior but have unfairly escaped criticism for it. As for the accuracy of my portrayal, consider that in 1986 Wilson sponsored legislation to provide amnesty to three million illegal immigrants and, on behalf of growers, bitterly resisted efforts by the Immigration and Naturalization Service to investigate the legal status of migrant farmworkers. But once the political and economic climate changed in the early 1990’s, he commenced regularly to denounce the terrible threat of illegal immigration, ultimately embracing an unconstitutional proposal (Proposition 187) to expel 300,000 young immigrant children from school because of their parents’ legal status. Similarly with affirmative action: in late 1994, Wilson publicly reaffirmed his decades-long support for minority set-aside programs in California, yet by early 1995 he was promising to repeal those same programs immediately as part of a crusade to “undo the corrosive unfairness of reverse discrimination,” which he soon made a central theme of his abortive residential bid. Governor Wilson and his spokesman are today almost alone in failing to recognize the political consequences of his harsh stands on ethnic issues. For example, in 1998 the Republican gubernatorial candidate, Dan Lungren, refused to campaign with the incumbent governor and made every effort to avoid any visual record of the two even meeting; when the Democrats finally managed to obtain such a photograph, they reportedly used it in targeted advertisements to Latino and Asian voters, helping to drive Lungren’s vote down to 20 percent in those communities. Presidential candidate George W Bush has similarly avoided Wilson like the plague, and in his California campaign has offered no role whatsoever to the state’s most prominent active Republican. As for Proposition 209 (affirmative action), I did contact its authors, did endorse it, and did offer my support of it nearly a full year before either Governor Wilson or Ward Connerly, I credit my attacks on affirmative action, as contrasted with Wilson’s then-support for that unfair policy, as the major reason I received over one-third of the vote in my challenge to the incumbent Wilson in the 1994 California Republican primary-despite my having started as a complete unknown, being massively outspent, and running as a pro-immigrant opponent of Proposition 187. Immediately after my COMMENTARY article appeared, Glynn Custred, the co-author of Proposition 209, called to thank me for having finally set the historical record straight on the terrible damage done to that campaign by Republican party leaders. Despite Mr. Walsh’s protestations, Governor Wilson’s sad legacy will be Proposition 187 and perhaps the long-term destruction of the California Republican party. MY THANKS to James Q. Wilson, with whom I agree on most of these issues. His point about the need to reduce illegal immigration is a valid one, though the numbers have already fallen recently, to the point where California’s agricultural industry is short of farm labor and has begun lobbying the federal government for help. One proposed solution to these labor shortages, and to illegal immigration generally, is a guest-worker program, but this has always been politically quite controversial. Mark Krikorian and Fred IkI6 share my opposition to multiculturalism and the ethnic fragmentation it produces. Whereas I would focus my efforts on rooting out that pernicious-and quite unpopular-dogma from our schools and public institutions and restoring our melting-pot tradition, they would work to reduce immigrant numbers. But their recent efforts to do so have notably failed, and anyway, as they themselves admit-@it, the total annual flow of legal and illegal immigrants is just one-third of one percent of the American population. Those of us seeking to avert the “disuniting of America” (to use Arthur M. Schlesinger, Jr.’s phrase) should therefore concentrate on the other 99.6 percent of the population. Above all else, we must restore the assimilationist tradition to our public schools, replacing native-language instruction and diversity-mongering with the teaching of English and of our common American cultural traditions. This battle will not be an easy one-the forces of the multiculturalist status quo are well entrenched in all our public institutions-but it can be won, and our allies will include an overwhelming majority of immigrants themselves and their children. To those who despair of victory, remember that nearly one million California schoolchildren who in 1998 were being taught in Spanish are being taught in English today. Edward Blum is correct to point out the huge overlap among the supporters of Propositions 187, 209, and 227; few voters may have understood all the details as they cast their ballot. Nevertheless, a measure expelling hundreds of thousands of immigrant children from school is very different from a measure promising to teach them English, and the parents of those children were well aware of the difference. Coming at my article from the opposite perspective, Arthur Kruger and Jay P Greene fault me as an extreme assimilationist, claiming that I seek to establish complete cultural uniformity among all Americans. They are mistaken. I firmly believe that family traditions, family cultures, and family languages should be retained-or discarded-by the individual families concerned, but I believe no less firmly that their maintenance should not be made the responsibility of the state or public institutions. Our public schools should teach our English language and our common cultural and historical traditions, and assist the children of immigrants and non-immigrant alike in becoming functioning, assimilated, productive members of our society@ If parents choose to send their children to private religious academies, or to after-school programs to maintain their heritage, that is well and good; but this is not our government’s concern. Mr. Kruger’s hope that California schools might have been able to produce students biliterate and bicultural in both English and Spanish is utopian. The problem California faced was graduates who were not literate in any language. Besides, with 140 languages spoken in the public schools, it is presumptuous to elevate Spanish above Chinese or Russian. Mr. Greene’s obvious enthusiasm for vouchers blinds him to a few simple facts. The overwhelming desire of so many Asian and Latino immigrant parents to send their children to private (almost always Catholic) schools represents a flight to assimilationism, not away from it. Whereas public schools teach the Spanish language and multiculturalism, Catholic schools teach the English language, American culture, and traditional academic subjects. During the Know-Nothing era, Catholic schools may have fostered sectarianism; today, they represent the melting pot and assimilationism, which our public schools have largely abandoned. The danger of vouchers in my judgment is that not all private schools are run by a leadership as benign as that of today’s Catholic Church. There are already indications that a number of inner-city voucher programs and charter schools are operated by nefarious characters; a full-fledged school-choice system might well result in 5 or 10 percent of America’s black children attending Louis Farrakhan schools, a frightening prospect. Hal Netkin’s concerns about California as a “welfare magnet” for illegal immigrants strike me as exaggerated: nearly all the stories that have come to my attention emphasize jobs and economic opportunity, not welfare, as the lure. But let us assume for the sake of argument that be is right: the solution, obviously, is to roll back our failed welfare system, thereby also alleviating some of the harm it has inflicted over the past three decades not just on immigrants but on our native-born population. In his defense of “white nationalism,” Jared Taylor protests too much. As whites become a minority, and to the extent that we continue our support for ethnic-separatist policies, the growth of white tribalism is perfectly understandable and inevitable; the increased explicitness of Mr. Taylor and others in expressing their views is a sure sign of this. But Mr. Taylor’s fear of white displacement is misguided, and based on an overly rigid definition of “white.” A century ago, many, perhaps most, Americans regarded Polish Jews and southern Italians as members of foreign “races,” and not really white. A generation before that, the Irish were similarly regarded. Perhaps an earlier Jared Taylor would have been horrified to learn that the Wasp “whites” of his day had already been swamped by waves of such foreigners and were now reduced to a small, powerless minority-, but today, fortunately, relatively few Americans see their society in that light-although our anti-assimilationist policies continue to encourage all of us in precisely that disastrous direction. Given a healthier political culture, and in light of today’s extremely high rates of intermarriage among whites, Asians, and Latinos, the term “white” could be further expanded within a generation or two or could perhaps be replaced by another and more accurate word. If we return to the assimilationist tradition in our schools and public institutions, our national culture and our national unity will survive and prosper. Among all modern nations, America has the strongest tradition of a melting pot. All we lack is the strength of courage to restore it. This entry was posted in Bilingual Education, Immigration/Race, Published and tagged Bilingual Education, Commentary, Immigration/Race. Bookmark the permalink.